These pea tendrils will give you a tasty pea flavour without the wait and is a great activity for kids and big kids alike! To start you will need a container like a recycled disposable plastic cup or yoghurt pots. 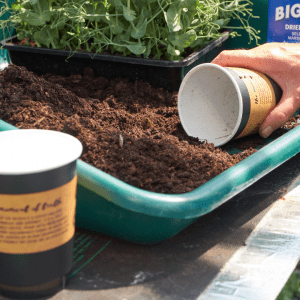 Or why not try the new compostable Frank and Honest coffee cup….any excuse for a decent coffee!. Then you’ll need to get your hands on dried peas. I’ve used Bachelors Peas here but any dried pea will do. You can soak the peas in cold water for an hour or overnight beforehand which will speed up the germination process, but it’s not necessary. 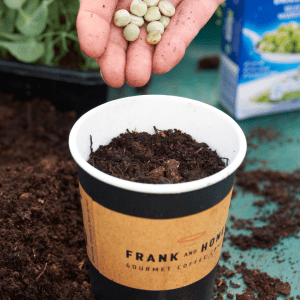 It’s important to keep the soil moist (but not wet) and in about three weeks when the pea shoots are 8 – 10cm high you should look to cut them off with a pair of scissors. If you cut them about 3cm up (above the first set of leaves) they will regrow to give you another crop.